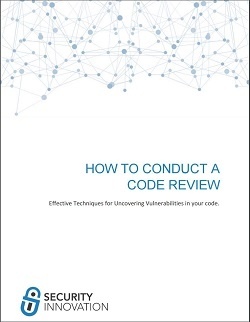 Do more for the security of your application with an expertly conducted CODE REVIEW. → Learn to detect vulnerabilities and bugs before the code makes it into an official build or into the hands of the test team when it may be too late. → Opportunity to learn from past reviews and share security best practices amongst your development team to help prevent future bugs. → Save time and protect your company's reputation by developing secure applications. Our guide focuses on identifying the types of issues that you should look for when conducting a code review, and how to find these bugs as quickly and effectively as possible. We also describe how to use threat models, architecture diagrams and other inputs to help in your review.